Consider a company with two sites (Amsterdam and Berlin) with separate networks. There is no routing between the two, that is, from Amsterdam you cannot reach (ping) a printer in Berlin and vice versa. Teach Printix about networks so it can filter what printers are available to users. A user while at the Amsterdam site will only be presented to printers on this site. You can optionally allow users to print between networks and print while their computer is on an unknown network, for example during travel or while at home. You can name networks to reflect the name of company sites or branches (Amsterdam, Berlin, …). The first network is named Network1. A network is defined by a collection of one or more Gateways (identified by their IP address and MAC address). A computer is considered to be on the network the gateway is part of. A computer can be on multiple networks – one for each active network adapter (LAN and Wi-Fi). A computer (laptop and hybrid tablet like the Microsoft Surface 3 or later) will appear as being on an Unknown network when it is powered-on outside a named network, for example at home or during travel. *If a CSV file with gateway IP and MAC addresses can be provided, then Printix Configurator can be used to add networks. That way you can add networks before computers are on them. 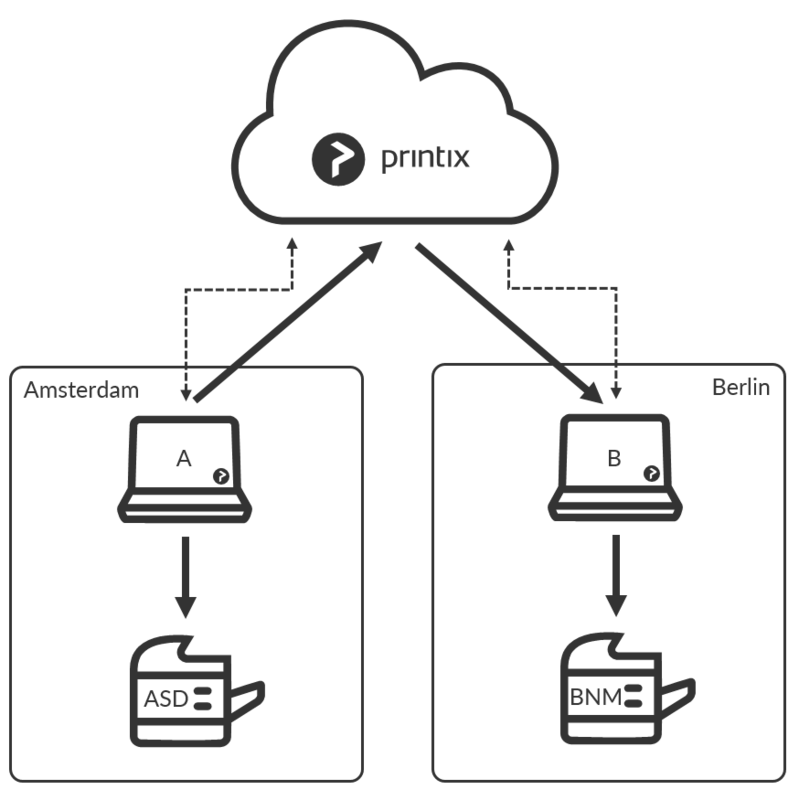 As you first deploy Printix Client in Amsterdam on computer A and discover printer ASD these will be recorded as being on the network named: Network1. You can modify the network name to change it from Network1 to Amsterdam. 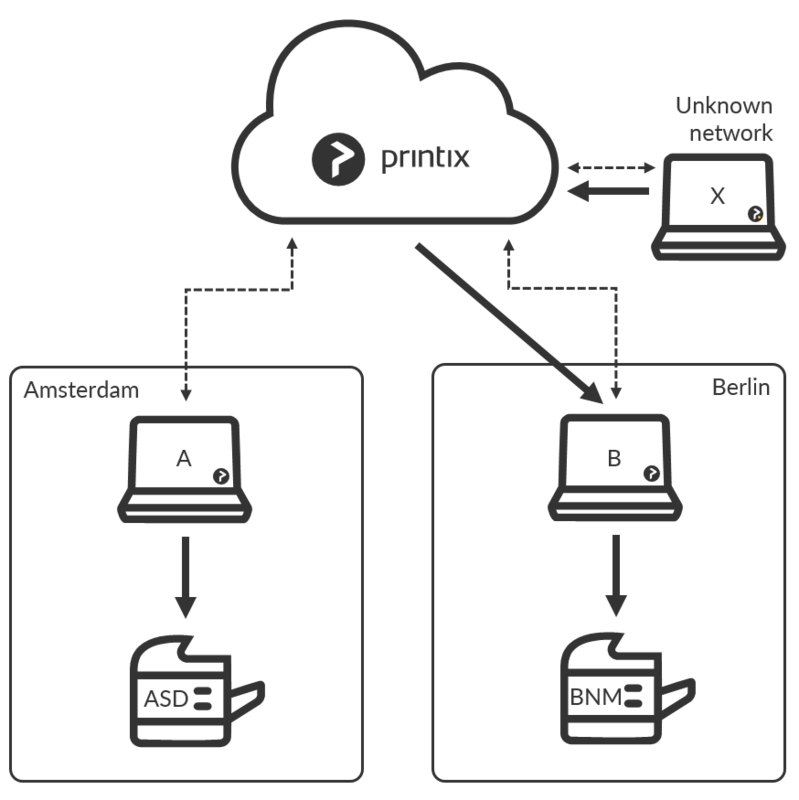 When you deploy Printix Client in Berlin on computer B it will appear as being on an Unknown network due to the unknown gateway. On the Networks page you can add a network, name it Berlin, and then add the relevant Unknown network to the Berlin network. By adding networks, you are teaching the system about your company’s networks. With the new knowledge, the system will attempt to automatically assign computers to the right company network in the future. Use Discover printers, select the Berlin network to add the printer BNM. An employee who brings a laptop from Amsterdam to Berlin will not have to change anything, as the laptop will automatically be reassigned to the Berlin network. Any of the print queues on the Berlin network, which has Add print queue automatically checked, are added automatically on the employee’s computer. Existing printers, including those added in Amsterdam, will appear as offline on the computer. When the employee travels back, the laptop is automatically reassigned to the Amsterdam network. During travel and at the employee’s home the laptop will appear as being on an Unknown network. Printing is achieved via Printix Cloud and a Printix Client computer on the printer’s network. At least one of the Printix Client computers on the printer’s network should have permanent network access. The document remains secure during the transfer over the Internet as the document itself and the communication are both encrypted. Enable printing via the cloud for printer BNM in Berlin. The user on computer A in Amsterdam can now add the BNM printer and print to this even though it is in Berlin. A user working on computer X at home or while travelling, can print directly and release documents to the printer BNM. 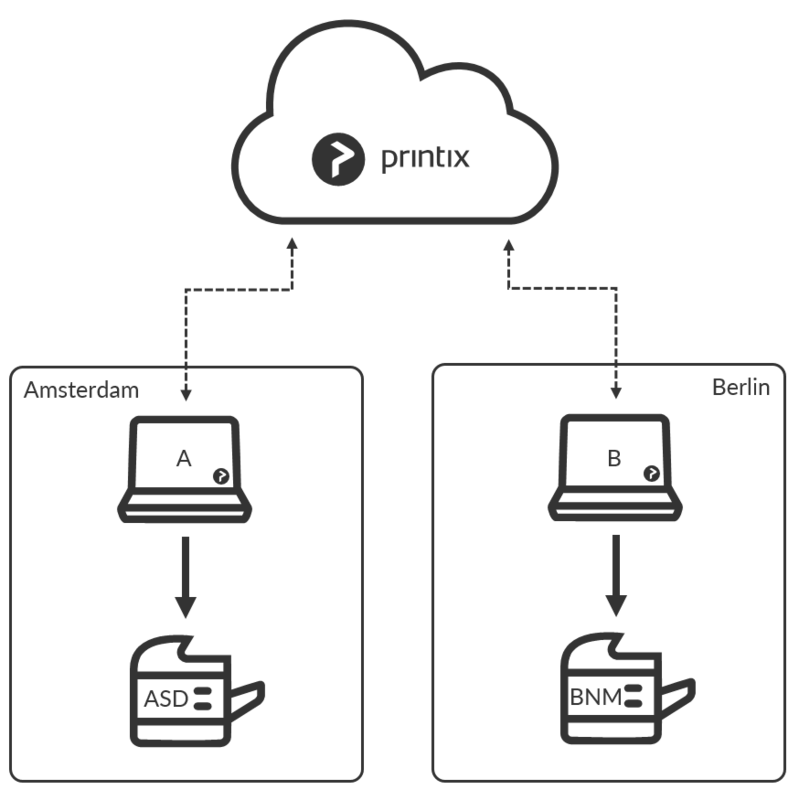 If you have a computer C with two network adapters, and it is on both the Amsterdam and Berlin network at the same time, then print data from computer A to printer BNM are automatically forwarded via this instead of via the cloud. Computer C should have permanent network access. If you Add cloud storage, documents printed Via the cloud will go via your cloud storage, rather than the Printix Cloud. In addition you can enable storage of pending documents in your secure cloud storage. Printers with Via the cloud checked. +1 While the computer is on an Unknown network it is possible to print directly and release print later documents to the printer BNM. +2 While the computer is on an Unknown network it is possible to release print anywhere documents to the printer BNM.